Zhejiang Jiaxing Port and Shipping Authority organized Zhajiasu line segment suburban Channel Maintenance Project seven design review meeting. Meeting considering multiple factors influence the cost, resettlement, construction, environment, etc., that the steel sheet piles revetment in the project is feasible, in principle agreed to the project design, marking the new steel sheet pile revetment of inland waterways will be cured in Zhejiang Province the first application. It is understood that, with the large-scale development of the ship, the northern suburb of River Zhajiasu line (channel coincides with the Hang Shen line segment) can not meet the needs of social and economic development. 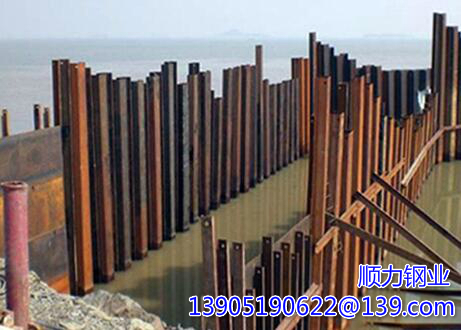 Steel sheet pile revetment has a strong bearing capacity, light its structure, simple construction, lower geological conditions require, both higher economic, flexibility and environmental protection and other features. The construction of the new steel sheet pile revetments located in the northern suburb of Hebei Zhajiasu line segment, total new revetment 2.8 km, will be applied to existing rear revetment finished steel sheet pile and then demolish the old revetment, ensure navigable waterways, flood protection along the Influence minimum. The implementation of the project will significantly improve the navigable waterway conditions to enhance the capacity, but also help prevent soil erosion along the two sides to further enhance the capacity of flood control along the route to protect the ecological environment on both sides of the channel.